Ever wonder how much LED ZEPPELIN is raking in each year with from digital downloads and streaming services? According to The Pulse Of Radio, Billboard has posted Nielsen Music's tally of the ZEPPELIN catalog from the moment the band's catalog first went digital, compiling the data between November 2007 and in streams in December 2015, both through July 12, 2018. Billboard posted the 94-song list is "based on revenue generated by digital activity since the band's music first became available at download stores like iTunes and on-demand services like Spotify." One thing the list, which includes YouTube plays, does not clarify is which specific version of each song — studio, live, or outtake — has been chosen for the ranking. 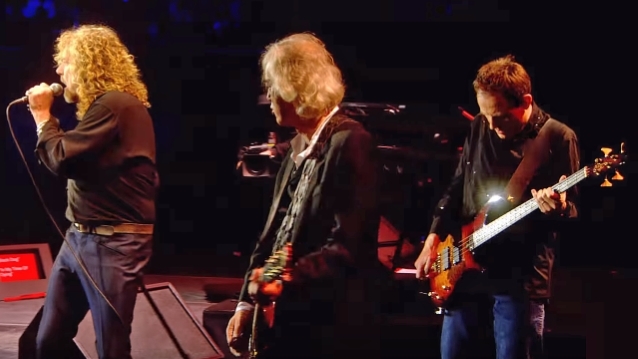 ZEPPELIN's top earner in the digital field is "Stairway To Heaven" ($2,903,223.42), followed by "Kashmir" ($1,421,130.32), with "Immigrant Song" ($1,306,140.94) coming in at No. 3. No. 4 goes to "Black Dog" ($1,167,232.19), with the Top 5 rounded out by "Whole Lotta Love" ($1,034,129.29). Interestingly, the final song on the list — coming in at No. 94 — is "Swan Song", a 1974 outtake from the sessions for the following year's "Physical Graffiti" album. The tune, which made the list earning a paltry $241.20 is due to its appearance on YouTube. As most fans know, the instrumental track, which was conceived by Jimmy Page as part of an unfinished suite, found its way into some of Page's riffs used during ZEPPELIN's final shows in 1980. In 1983, during the historic ARMS tour, portions of "Swan Song" popped up in the tune "Bird On A Wing" performed at the shows, before finally morphing into the 1985 FIRM track "Midnight Moonlight". Jimmy Page explained that the members of LED ZEPPELIN both found themselves and came into their own by joining forces. "There is some, like, divine intervention at this point that must bring us all together, because John Bonham, for example, wasn't even known down in London, he was only known locally; although I saw him play with Tim Rose in London," he said. "And he played, but he never had the chance to play drums like John Bonham was going to play in LED ZEPPELIN. And John Paul Jones — a fine session musician and he'd done some arranging — but he never had the chance to show what John Paul Jones could do until he was in LED ZEPPELIN. And the same with Robert Plant."